We have a range of promotional material available to members of the RCVS Practice Standards Scheme to help promote accredited practices. This video helps to promote the PSS to the animal-owning public, explaining what RCVS accreditation can mean for clients and their animals to encourage people to look for the RCVS accredited practice logo. A slightly different version of the video is available for you to post on your practice website and social media channels. There's even a subtitled version if you would like to play the video in your waiting room, so you can keep the volume down! For either of these versions, please email the PSS team at pss@rcvs.org.uk. This slideshow takes a light-hearted look at visiting the vets, through the eyes of Norm the Nervous Norfolk Terrier and friends, and gets across some key messages about gaining RCVS-accreditation for your practice, the work involved and the benefits it brings for both clients and patients alike. It's available in a variety of formats (PowerPoint slideshow, jpg images and wmv video) and in three different screen sizes (4:3, 16:9 and 16:10 ratios). Please email the PSS team (pss@rcvs.org.uk) to request the link to download the slideshow via Dropbox, stating which format you would like. Wear your accreditation with pride! These smart enamel lapel badges can be worn by anyone in the practice team, to help promote your RCVS-accredited practice status to your clients. The badges are lightweight (just 6g), have a secure brooch fastening and measure 28 x 20mm. Each badge costs no more than a £1 including VAT (minimum order five badges) and postage, with quantity discounts available. Please download the order form from the ‘Related documents’ box. Help your clients to mark their place with an RCVS-accredited practice bookmark. These bookmarks are to give away to clients, to help promote your RCVS-accredited practice status and provide them with more information about the Practice Standards Scheme and the stringent standards you have met. Upon accreditation all practices receive a free sample of bookmarks. Further bookmarks cost £15 per 500, including VAT and postage. These distinguished-looking wall plaques provide your practice premises with the official RCVS-accredited practice logo, together with the category of accreditation or award received. The new plaques are made of acrylic and stainless steel, and come with fixings to be both wall mounted and free standing. Accreditation plaques cost £80 (including VAT and P&P). All achievable combinations of Accreditations are available at this price. Award plaques cost £65 (including VAT and P&P). Each Award must be ordered as a separate plaque. Discounts are available for bulk orders. Please email the PSS team at pss@rcvs.org.uk for more information or to place an order. 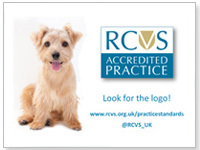 You can use official PSS logos on your practice stationery, advertising, website etc, providing you are an RCVS-accredited practice (see our Advertising guidelines). Upon accreditation, all practices receive free of charge a memory stick containing logos appropriate to their accreditation category. If this memory stick goes astray, we can email the logos to you free of charge, on request (please contact us).